Make your best friend birthday more interesting. 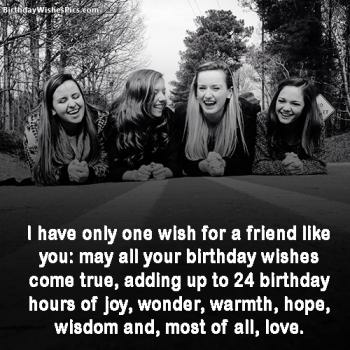 Get birthday wishes for your special friend and share with them on his/her social network or directly share. May this day opens up new doors to success and serenity for you my special friend. Congratulations! You are born to be a great friend! I am lucky to have you.Happy birthday dear! Your day of coming into this world means a lot to me. 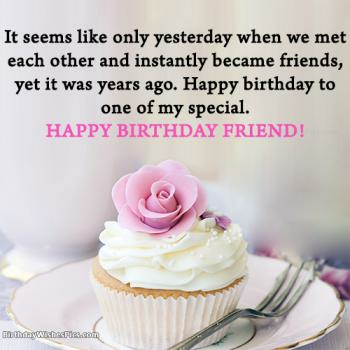 Happy birthday dear friend! I pray to God to grant my special friend like you a life full of roses free from thorns. 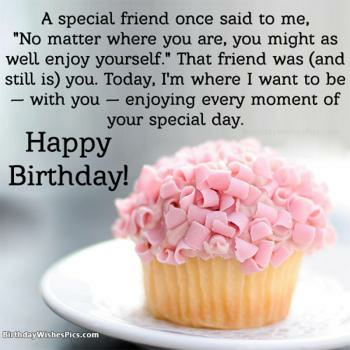 Your birthday is as special to me as my own. 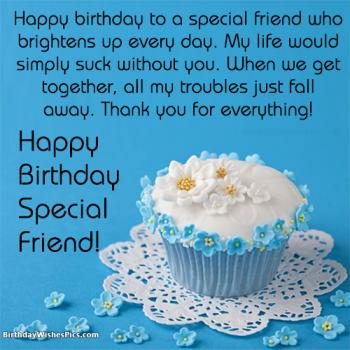 Best wishes for my special friend. I wish this day of your life's new year brings in bundles of good things to you. Enjoy it at fullest. You are a person with a gem heart, a gem not less than a diamond so I wish you have a diamond life too. Happy birthday my gem!! 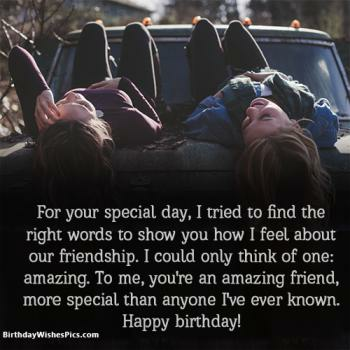 You are one of the best things ever happened to me so do your birthday. 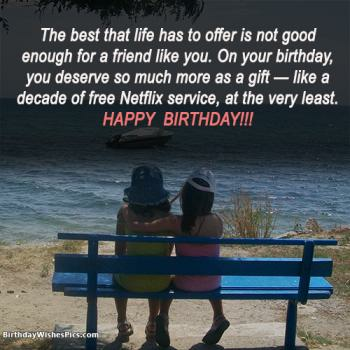 Happy birthday, dearest friend! 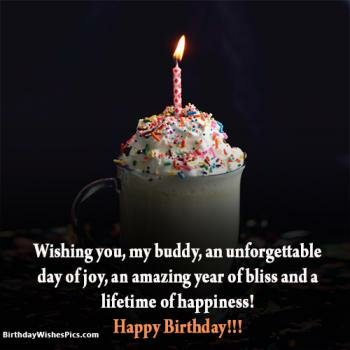 I am sending a special birthday cake for you, with candles of hope, bliss, and fortuity and wish they keep shining your big day, New Year and the years ahead. I hope your day will mark an end to your gloomy past and start a new phase full of life. Happy birthday buddy. 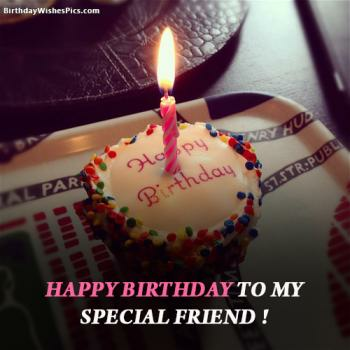 There are uncountable catchy words but you are so special that I do not want to play words on you so straight from my heart I send you Happy Birthday my pal! May you a have day full of a fun dear friend. 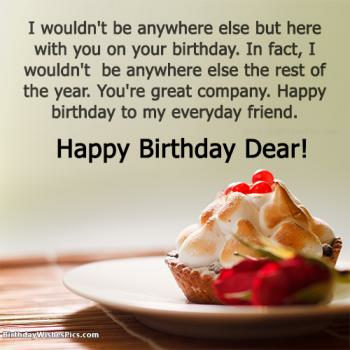 May you keep on adding candles to your cake without a full stop. Happy birthday! I pray you do not encounter a pause to your enjoyment all day long your big day sweetheart! Sending your way shine of stars, the warmth of sun and coolness of moon to celebrate your big day. Happy birthday, beloved friend. 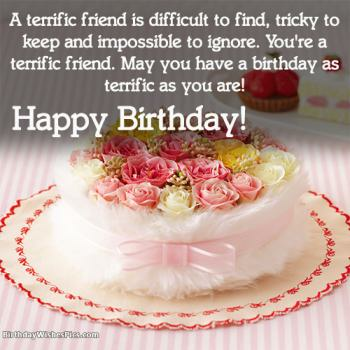 May you have many more exciting birthdays in years to come. 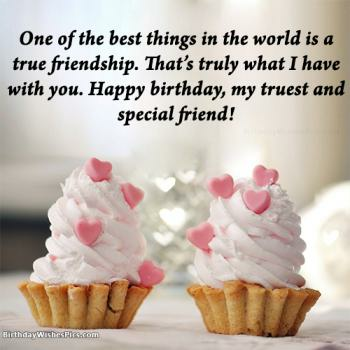 I am not there to celebrate your special day but I wish our friendship memories will rejoice your birthday. Happy birthday to the dearest friend who has been always by my side! Your friendship keeps me strong and moving up in life. 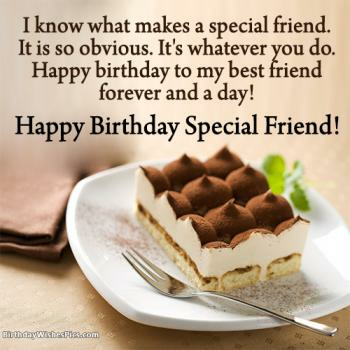 Birthday of a friend like you is to sing, dance and cherish existence, so let’s have most of it, buddy! One year off of your life but the good news is that you succeeded completing it, new is beginning so nail it champ. Happy birthday! In this busy chaotic life, your birthday comes as a spring shower. It's saddening to think one year is consumed by friendship life but our friendship is one year older that’s a happy moment too. 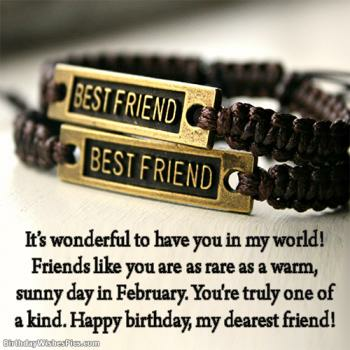 Happy Birthday dear friend! It doesn’t matter how long we have been companions, what it matters is the chemistry we have mate! Your birthday is so much to me. Life may see an end but our friendship is immortal my buddy. Wish you a birthday full of happy memories. Had you not taken birth on this planet I would have been devoid of a friend who is actually more than just a friend. 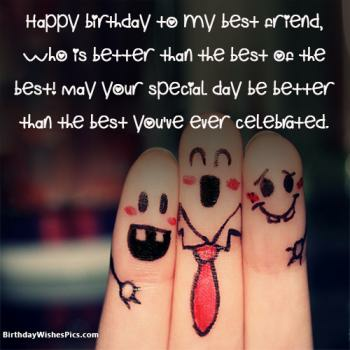 Happy birthday my best friend! Apart from a formal way of cheering a great friend, sometimes a twist can also add a flavor to birthday greetings. 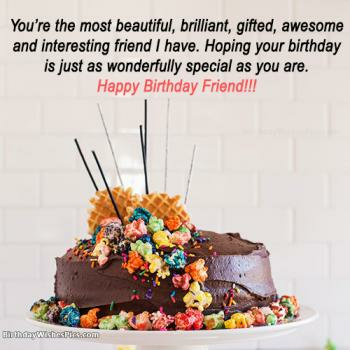 When little crunch is added to the words you chose to wish a special friend’s birthday, it brings a lively cheer on their face along with the happiness of knowing you remember the day. 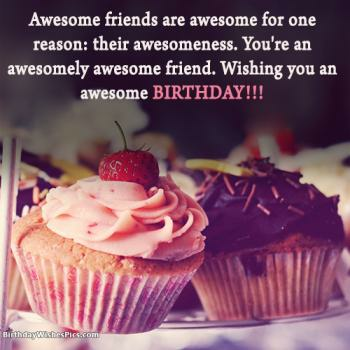 So why not counting on some jolly birthday greetings!. 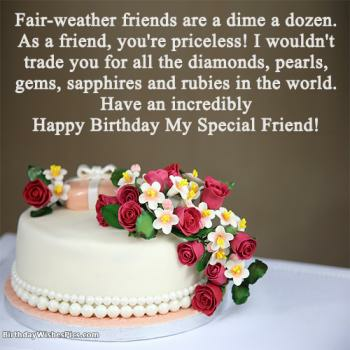 Make feel them extra special just share above birthday wishes to your special friend. I must tell you as you are very dear to me, birthday is basically a sign of aging! So I have brought you an anti-aging formula instead of a cake. Don’t mind but happy birthday friend! I am indebted to God that He sent such a clown for me who is the reason behind my smiling days. Happy birthday buddy! 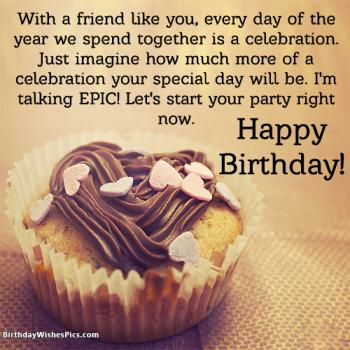 Hey someone told me I must wish you a happy birthday! I thought I should console your painting heart to be one more year older. Happy one-year addition to your age! Happy birthday dear friend but hey so don’t forget to brush your teeth before you say cheese for a birthday picture. I went looking for candles for your birthday cake but the salesman packed me a pack of cigars. 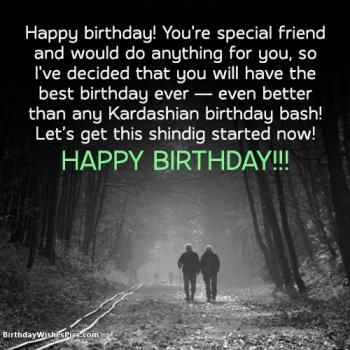 So have a smoky birthday friend! Do you want me to wish you another year closer to death! Okay, have a happy step towards it! Though roses are red, my dear friend is not that bad! Hope you liked my poetry. Happy birthday. I baked a cake for your birthday, It’s little overcooked and got a dark brown color but no worries I know you love chocolate. Happy brownie birthday! You are truly a bunch of cauliflower, don’t mind they it costs more than roses. Happy birthday my cauliflower! Hey you know there’s free buffet on the roadside, let’s have your birthday dinner. I know you are not going to arrange one at Taj. Happy birthday my poor pal! One more year of your biological age gone and I wish you have grown too. 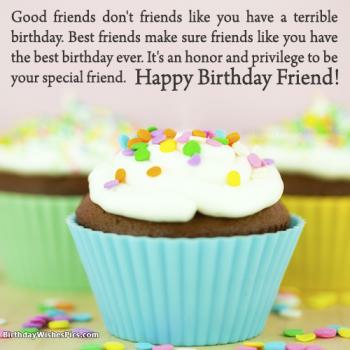 Best wishes to a special friend. Though you do not deserve to be wished for the 60th birthday still you are my best friend. So have a bouncy birthday! You are my secret keeper, and I am yours but do not worry I forget people’s ages very quick. So happy 16th birthday for the 5th time. 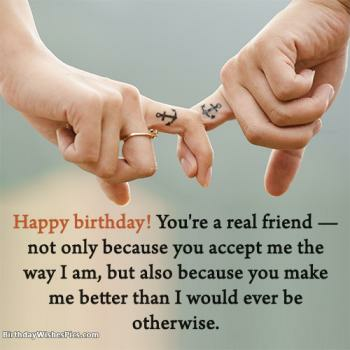 Happy birthday to the greatest of the friends, you always stand by my side through all thick and thin, you are not a friend but a blessing from God. Do not forget to copy paste same on my wall for my birthday! So, what are you waiting for a mate! 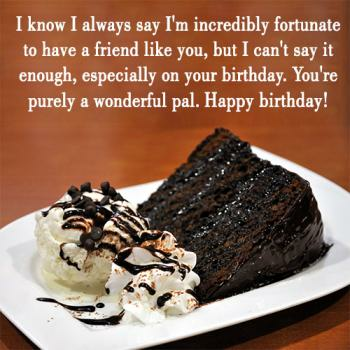 Copy and paste funny birthday wishes to a friend if it’s his big day, remember this is the day to cherish your friendship. So chose the best words for a special companion of your life. Birthdays are the most awaited days of the year not only for kids but also adults. It is the day when a person celebrates the anniversary of their birth. It can be celebrated by preparing food especially birthday cake, sharing gifts, and arranging a birthday party, invite friends and family. 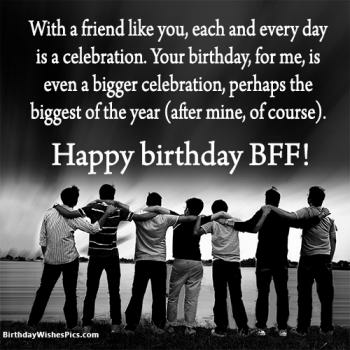 And most important can be celebrated by sharing happy birthday images to a special friend. 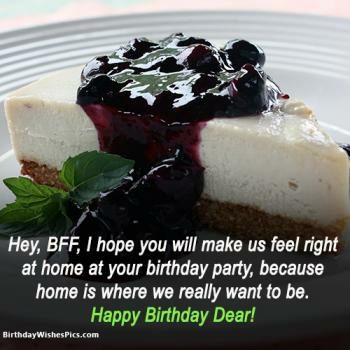 If it's your best friend birthday then browse down for the happy birthday special friend images with messages. 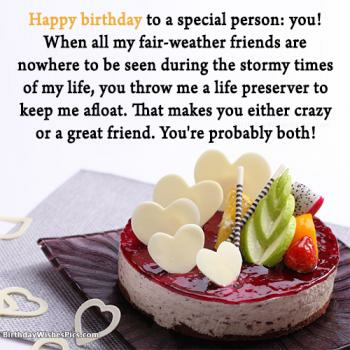 Celebrating birthdays are not complete without sending and receiving birthday wishes images and cards. May that is sent electronically or traditionally. Today, we can send greetings in aggregations of different forms. Some may choose to send a greeting card. It can be handmade or bought from stores. Most may send wishes electronically. like via email, Facebook, Twitter and so much more. 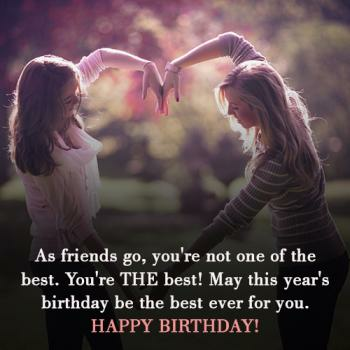 Here we have designed the best happy birthday images with wishes that you can share with your friends, families and special someone. You can share these images on any social network such as Facebook, Twitter, Google Plus, Pinterest, and much more. 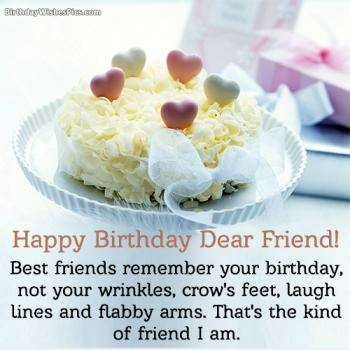 Impress your special friends with beautiful happy birthday wishes images. Hope they will love it. Make feel them happy and extra special.